Neither lion nor giraffe nor Pekinese will ever forget Mr. Wilmer—and you won’t either for when a man and a horse converse with each other, that’s news—particularly if the man is a small, shy clerk in the Safe, Sane, and Colossal Insurance Company, and the horse is an angry steed belonging to a large policeman. Mr. William Wilmer’s twenty-nine years had been filled to the brim with dull routine, completely unexciting—except for a daily smile from red-headed Miss Sweeney—until that miraculous birthday morning in April, when he distinctly heard the policeman’s horse refer to the policeman as a “big, bull-necked, ham-faced, overbearing bully, a stupid selfish, heavy-bottomed brute!” Suddenly he was a Prominent Figure, in demand everywhere as animal interpreter, endorser of commercial products, and Expert on Animal Problems. However, Mr. Wilmer’s rocket-like advance to fame and fortune did not destroy the lovable simplicity that made every animal open his or her heart to him! (Jessica's own summary). This is the first review in what will be an ongoing series I’m planning called: Why Is This Out Of Print?! So, fittingly, I’m starting off with one of my favorite books of all time, a book so charming that if you ever find a copy you must clasp it to your bosom and never let it go, a book whose out-of-print-ness defies logic! 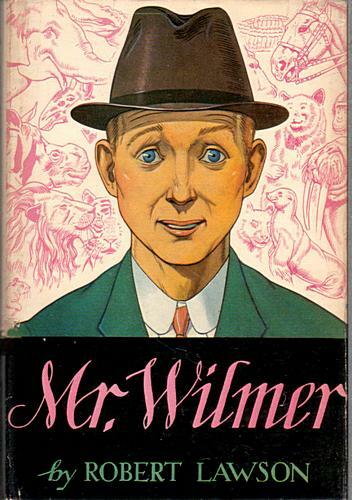 Mr. Wilmer was written and illustrated by Robert Lawson, Newbery Winner for Rabbit Hill, illustrator of Ferdinand the Bull, author-illustrator of Ben and Me . . . all of which are lovely, and all of which are still in print, and yet this book, which is by far his most delightful (in my opinion) is largely unknown! Baffling! But let us not dwell on that unpleasantness! Let us talk about why this book is so delightful! In a word? The characters! This book is chockfull of some of the most endearing characters you will ever meet, from timid yet kind Mr. Wilmer to his lazy landlord Mr. Keener, the scourge of the industrious, much put-upon Mrs. Keeler! There’s the charming and hilarious Zoo Director Carrington Carrington-Carr, with his expensive tweed suits, and wealthy, perpetually teary-eyed socialite Mrs. Protheroe Plushington, whose beloved Pekingese Frou-Frou is a bad-tempered little brute whose words Mr. Wilmer has to censor before repeating them to his devoted mistress. Oh, yes! Some of the best characters are the animals: Lucy the Elephant, a lady from the tip of her trunk (you don’t think it’s too long, do you?) to the bottoms of her aching feet, Toby the Lion who suffers from toothache, Frou-Frou, Walter the Seal whose career with the circus is cut short by his terrible stage fright . . . every one of them is so much fun to read about that I giggle nonstop every time I open the book. I recently read it aloud to my son (and my husband, but he hates to admit he’s listening) and both of them were instantly hooked. My son loved the stories about the animals, my husband couldn’t hide the fact that he was involved with the human characters. And he made the point, which had never occurred to me before, that this was a highly unusual book, or at the least, a book that couldn’t be “done” today. Ostensibly for children, the main character is a twenty-nine-year-old man! In fact, not one of the human characters is under the age of, say, twenty-five. Some of the humor also goes right over the heads of the kiddies: not that it’s naughty, just that it’s things that they wouldn’t “get”, like his secret crush on Miss Sweeney, Mrs. Keeler’s constant digs at Mr. Keeler, and little things like that. Perhaps that’s why the book is no longer in print, but frankly that’s a pretty poor excuse. This book has marvelous appeal for all ages, and I urge you to go out and find a copy today! Or check your local library! You may get lucky! Jessica Day George or you can find her books here. I found this book in my parent's collection when I was about 11 years old, and I loved it! That was in the mid 1960's, and like you, I always wondered why no one knew about it. I'd love to find a copy of it. In the meantime, I enjoyed a little trip down memory lane with your descriptions of some of the characters. Thank you! This was one of my favorites as a child; If remember dorrectly, Mr. Wilmer loved to eat peppermint patooties. When I first found the book in the library, the title intrigued me since that was my father's first name. Amen! This is one of my all-time favorite books, ever since I first read it at 11. And when I recently bought a discarded library copy on Amazon, I was overjoyed to realize that the book had plenty to offer a grown-up me, things that gone completely over my childish head the first time around. I was a shy child myself, and I have never read a book that more accurately portrayed the agony of a shy person trying to reach out and communicate something very important in the face of crippling shyness, as when Mr. Wilmer gathers his courage, but then cannot get himself to enter his old employer's building to ask Miss Sweeney to come work for his as his assistant, and instead he settles for sending flowers and a note. This book is a gem just for that! Ever after, I considered the only true way to leave your own wedding would be in a houdah, on the back of a beloved elephant. Great for everyone, and full of sweet little jokes for all ages.